How to find the perfect local music to fit your mood this summer. 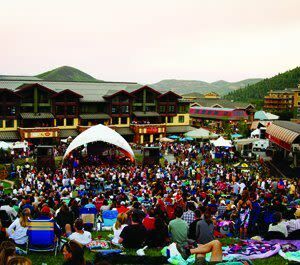 Canyons Resort Village, July 5–Aug 30, 6 p.m.
Genre Major touring acts Vibe Think of this as a micro-Coachella or Beale Street Music Fest. Bring your picnic basket or grab food from one of the street vendors. There’s a Utah State Liquor Store on-site at the Westgate Market, inside the Westgate Resort. Park City, Sat and Sun, June 22–Aug 29, 1:30 to 5 p.m.
Genre Jazz, bluegrass, or folk in an “unplugged” format Vibe This intimate venue is an Old Town gem. Grab an icy beverage from the beer garden, take a seat under the trees or an umbrella, and let the decompression begin. If the chairs are full when you arrive, be patient: people tend to come and go from this cozy, casual venue. Kimball Junction, Thu, June 19–Aug 28, 6 p.m.
Genre Up-and-coming national and regional actsVibe Emerging bands and musicians in a sometimes raucous forum environment. Carry-ins are welcome. Or book a table on the patio at Maxwell’s (435.647.0304) or Good Thyme’s Bistro (435.615.7090), both of which face the stage. City Park, Mon, July 7–Aug 11, 6 p.m.
Genre Chamber music performances as part of the Park City Beethoven Festival (pcmusicfestival.com) Vibe Relatively sedate (think chardonnay versus PBR); a great opportunity to expose your family to chamber music with neither the pricey ticket nor the buttoned-up formality. Coolers, kids, and leashed dogs are all welcome. 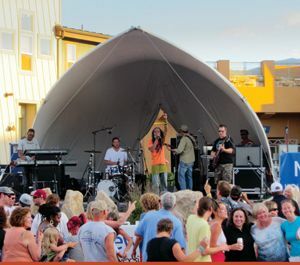 Quarry Village Sun, June 22–Aug 31, 6 p.m.
Genre Local and regional touring acts Vibe Similar to Deer Valley’s Wednesday-night concert series, just smaller. Families from Pinebrook, Summit Park, and Jeremy Ranch gather on the grassy lawn here to wind up the weekend. Or sit and listen on the patio at Billy Blanco’s with a plate of Baja fish tacos. Snow Park Outdoor Amphitheater, Wed, June 18–Aug 27, 5 p.m.
Genre Local bands and singer-songwriters VibeExpect to share the wide, grassy hillside with hundreds of other hump-day concertgoers. Bring your cooler and let your kids cut a rug down near the stage. No picnic? No problem. Order a dee-licious gourmet dinner basket from Deer Valley (435.649.1000). Genre Local mixed bag, soloists to bands Vibe A livestock pasture provides the rustic backdrop to the shows here, which feel a lot like family picnics. A pavilion and mature cottonwood trees offer pleasant shade in midsummer, and swings and a slide are obvious kid magnets. Arrive early to stake out a grill.